The L.S. Starrett Company will be highlighting metrology systems at HOUSTEX including the HDV300 Horizontal Digital Video Comparator. The system combines the best features of vision and optical comparator technology, with a uniquely designed interchangeable lens mounting system, go/ no-go digital overlay capability directly from part CAD files, real time video edge detection and more. With 12" x 6" of stage travel, the HDV is configured like a traditional horizontal comparator. The system has a uniquely mounted 5MP digital video camera, coupled with a choice of quick change telecentric lenses or 6.5:1 zoom for micron-level resolution. The HDV system includes a powerful 64-bit PC and touchscreen monitor, which runs MetLogix M3 Metrology software. With this software, DXF CAD files can be imported and 2D Go-No-Go gages created, similar to using a Mylar overlay chart on a comparator screen. Video edge detection (VED), allows real-time interaction of the imported file with the video image of the part being inspected, resulting in enhanced productivity, speed and accuracy. 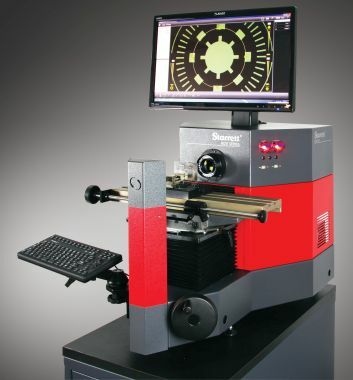 Starrett will also be demonstrating new force measurement solutions including the L1 innovative, entry level computer-based force testing solutions for applications ranging from load limit and distance testing to break limit, time average, cyclic count and duration testing, constant hold and more.